Small, rather posh and expensive not-really-a-pub in Farringdon. As of March 2007, Adnams Broadside was £3.20 a pint! It also took ages for Kake to actually get served because the staff member taking my order kept getting distracted. That part was really quite odd; it almost felt like he was just playing at being behind the bar. 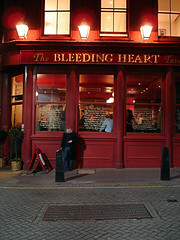 It's not really the sort of place where you spend the evening; more a meeting point before you move on somewhere else (downstairs, or somewhere else nearby, or one of the other places in the Bleeding Heart group, a little further down the yard). But as a meeting point, it does the job. In the upstairs (pub) area, they have tables against the bar. bob found the beer to be pretty good. They do food, plus there's an actual dining area downstairs (as well as a separate Bistro and Restaurant further into the Yard). Ewan had lunch downstairs, and although the service was slightly slow, the food was all mostly excellent from a very good menu photo of menu in November 2009. A starter of crab cakes (actually just one, £7.50) photo and wild rabbit pâté (£6.50) photo were both fine, but the spit-roast suckling pig main (£14) photo was hearty, while Ewan's grilled rump steak with fries and Béarnaise sauce (£15) photo had some particularly fine chips and the steak was mostly cooked as ordered (pleasingly rare and bloody, though a smaller piece was much more chewy and overdone). Leon went with friends at 8am for breakfast. The Full English was actually quite good, but the service was terrible - they would always do something else before helping us. The food took half an hour to arrive, which is spectacularly slow for breakfast. It came to ten pounds per head. We did not leave service. Last visited by Ewan and friend, 25 November 2009. Last edited 2013-05-10 06:47:28 (version 15; diff). List all versions. Page last edited 2013-05-10 06:47:28 (version 15).